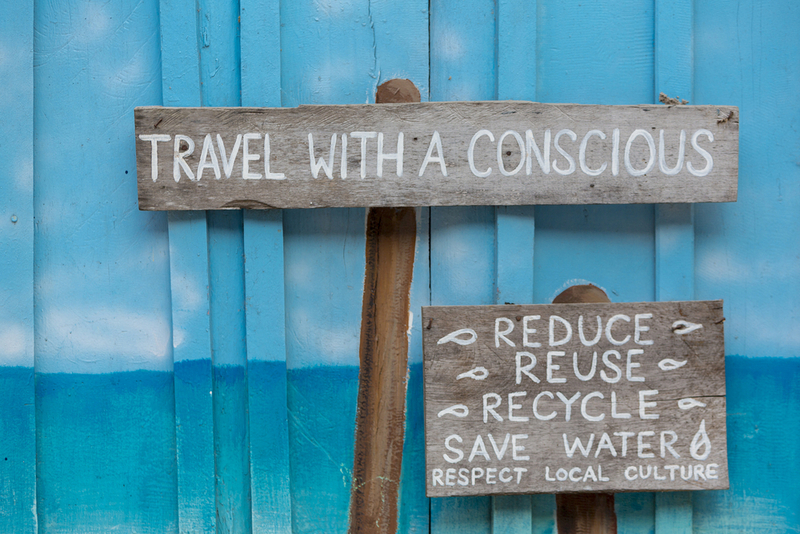 7 Ways To Travel in an Eco-Friendly Way! Most of us know about leaving no trace when we visit a place, but there are plenty of ways that tourism can have a negative impact on an ecosystem, especially in areas where those ecosystems live in delicate balance. Being a tourist doesn’t mean that you have to leave a harmful imprint, however, and it also doesn’t mean you have to jump through a ton of hoops or buy expensive gadgets to be a conscientious traveler. While most of these suggestions are applicable to our daily lives, these are particularly helpful to make sure you leave the smallest impact whether you’re heading out on a road trip in your hybrid vehicle or adding another stamp to your passport at some exotic locale. 1: Use a Reef Friendly Sunscreen! Keep an eye out for products that are labeled “reef-friendly” or check the ingredients–-you’re trying to avoid oxybenzone (BP-3) and octinoxate in that list. It’s available anywhere that you would buy sunscreen, and many island and coastal resorts have replaced their offerings to only include the reef-friendly versions. 3: Bring an Insulated Bag! An insulated tote bag (those freezer bags found hanging at the front of grocery stores) is one of the most versatile, eco-friendly items you can pack. It takes up almost no room or weight in your suitcase on the way there and can be used as an extra carry-on for souvenirs on the way back. While at your destination they can be used for a shopping bag or small cooler. They also make great laundry bags, wet clothes and towels bag while you’re day tripping and wet/dirty/sandy shoe bag for the trip home. A quick clean out with a garden hose upon returning home and the bag is ready to carry all of your frozen goodies during your next shopping trip. You can bring your favorite reusable water bottle or buy one from your destination! A reusable water bottles can make great gifts or souvenirs but if you already have one we recommend you just keep using that! While most of us know not to purchase things like ivory, bird’s nest soup, or shark fin soup because of the incredibly cruel practices used to acquire the items and ingredients, there are plenty of other animal, plant, and environmental items that you shouldn’t take home with you. Those basic leave-no-trace principals apply here—take only photographs and leave only footsteps. Don’t scoop up shells and sand, don’t take rocks from ancient architectural sites, etc. It’s just not cool. Reusing your towels and sheets for more than one day not only helps save water but electricity as well! Make sure you hang your towels to dry so you can use it for a couple of days before having it laundered or washing it yourself! Same with your sheet! You don’t change your sheets every day at home why would you do it on vacation! Buying locally not only helps support the local economy and keep small businesses open but it is so much fun to walk around and see what is for sale! Take some time to try the local fruits and vegetables and pack some away for snacks during your next hike!